Social media platforms have changed the way we engage with one another on issues we care deeply about. Twitter, Facebook, and other forms of social media are great for keeping in touch with friends and staying up to speed with the latest news, but they are also incredibly useful for organizing on campus. Whether you’re interested in advertising an on-campus event, attracting new members to your student group, or assembling a protest, social media can help you reach your goals in an efficient and cost-effective way. Posting on your personal page can help garner support and attention for your cause, but you don’t have to stop there! Creating a Facebook page, a Twitter profile, or an Instagram account for your group is a great way to promote your initiatives to the entire campus community. Your group’s meeting time and location. While students or student groups may be able to use university listservs, social media is also an important tool for expanding your network. Because listservs may be limited to those already involved in clubs and extracurriculars on campus, you might be reaching out to only a small portion of the campus community. Social media allows you to reach a community beyond those who are involved in groups on campus. You never know who might be interested in your mission or in volunteering with your group, so do yourself a favor and ask friends to help create a web of impact. Encourage members to invite their friends to ‘like’ your Facebook page or follow your group on Instagram or Twitter. Planning events can be tricky. Luckily, social media offers inexpensive and efficient ways to let others know about activities happening on campus. By creating a page for your event, you can invite your classmates to attend, and track interest in your event. Any other relevant information, such as event co-sponsors and how to get involved in your group if students cannot attend. Strive to make your event page as attractive as possible by including graphics and images. If you can, design graphics (such as a cover photo) that include all of the event’s information so that it can be easily seen by those on your page without having to click through for information—this may even attract more attendees! Some schools have student graphic designers whose job is to create promotional materials like flyers and social media graphics for recognized student groups free of charge. This is a tremendous resource, so explore whether or not your school offers it! Like you, other student groups and professional organizations look to social media to increase their visibility and promote events. Utilize this network by following the pages for other student groups on your campus or neighboring campuses with similar missions. Following these pages can give you inspiration for your group’s programming—especially if your group is newly formed. If you see the potential for cross-promotion or partnering on an event, reach out to them either by direct message or by email. Partnering to organize an event can allow you to host a larger-scale event and maximize the reach of all organizations involved. Working with similar groups at neighboring schools can greatly expand your network of student followers and show how your mission impacts more than just those on your campus. 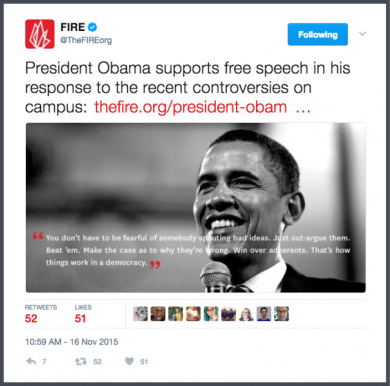 Follow national organizations, like FIRE, that may have an interest in your campus activism. This helps you stay up to date with their work and can open doors for collaboration. You never know who may be interested in highlighting your group’s work, so be sure to appropriately tag other organizations in your posts. A retweet from a national organization or even other campus groups can expand your reach and gain you new followers, so don’t underestimate the power of tagging ally organizations. If you need to work with alumni or attract working professionals, consider using LinkedIn. Posting longform pieces about your organization’s work, the need for alumni involvement, and pitching fundraisers can all be done effectively on the professional social network. Don’t feel like you need to stick with just one social media platform. Sometimes promoting events on Facebook is more effective than posting the event on Twitter. Likewise, posting an article or blog on Twitter may gain more traction than on Facebook. 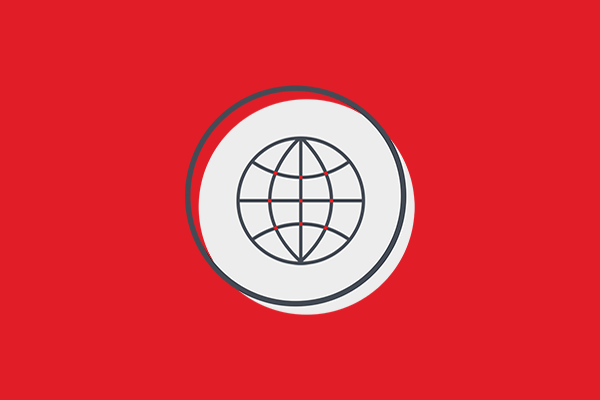 Use your best judgement to determine what platforms are best for different content. Strive to be concise and accurate—and funny, when you think it’s appropriate. Link to your other social media pages. For example, link to your Facebook event on Twitter or Tweet a picture you posted on Instagram. Context and tone can be difficult to interpret on social media. This is especially true for Twitter, which has a limited character count. Write tweets with the understanding that people may misunderstand what you’re saying. If you make a joke or use sarcasm, people may take it literally. If you are unsure about a post, run it by another member of your group or a friend.